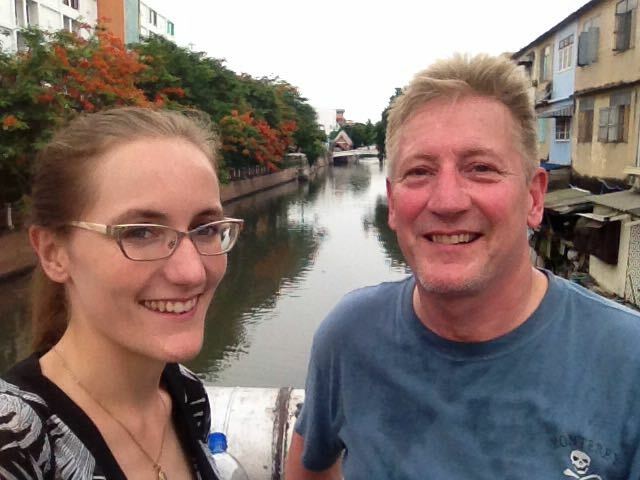 Mike and Kelly’s Big Adventure: Bangkok and Phuket – Where in the world is Kelly? It was almost midnight when I reached the platform of Phaya Thai station. Only a few other passengers were waiting, alone and in pairs, in the humid night air. 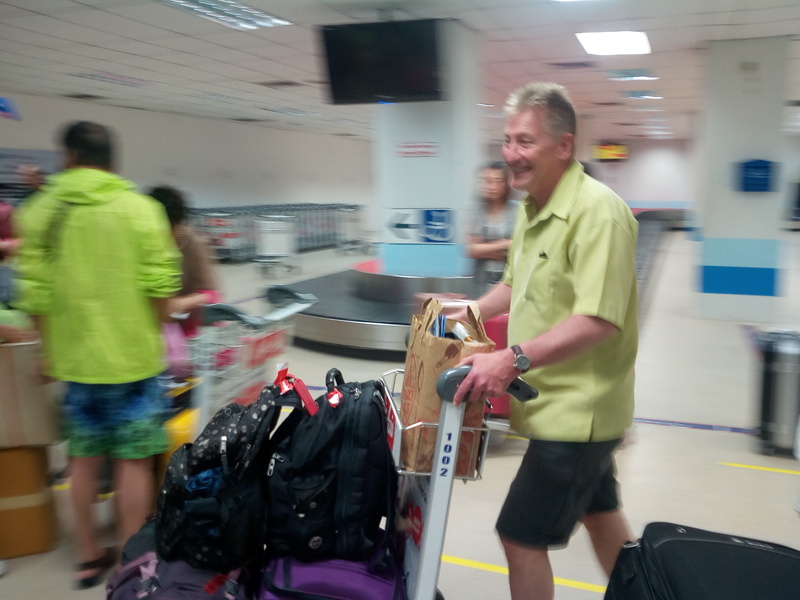 Some had suitcases, others were still wearing their work uniforms. No one talked. The last train arrived and we midnight riders boarded in silence. The automatic doors closed with such force that I wondered if anyone has ever been caught in them. I shuddered away the thought and enjoyed the quiet, 30 minute ride to Suvarnabhumi airport. My final destination was the airport itself. I was the welcoming committee of one for a very special occasion: the arrival of my father, Mike. Since 2010 I have made frequent trips to Thailand and other countries in Southeast Asia but never has anyone come to travel with me. 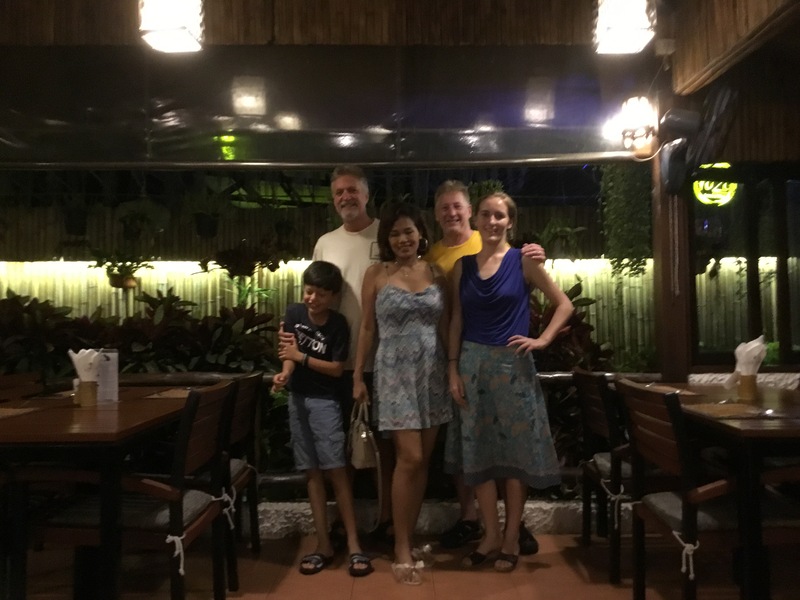 Last August, my family made the decision that it was time for a family vacation in Southeast Asia. My mom decided to stay home, but my dad was keen for the adventure. Nine months later here I was in Suvarnabhumi’s arrival hall, eyes scanning the crowd, not quite believing that my dad would be found in the masses streaming out of immigration in the middle of the night. And yet there he was. He looked a little tired and a cut on his chin gave him a rugged look. Other than that he looked no worse for the wear after two days on airplanes. I spotted him first and then our eyes met. We both broke out into smiles when we embraced. Nine months is a long time to talk only via WhatsApp and Skype! We fell into our usual banter without missing a beat as a taxi whisked us away to our temporary home at the Old Capital Bike Inn. We arrived at 2 a.m. and dad was feeling wide awake. After all, it was 2 p.m. according to his body clock. 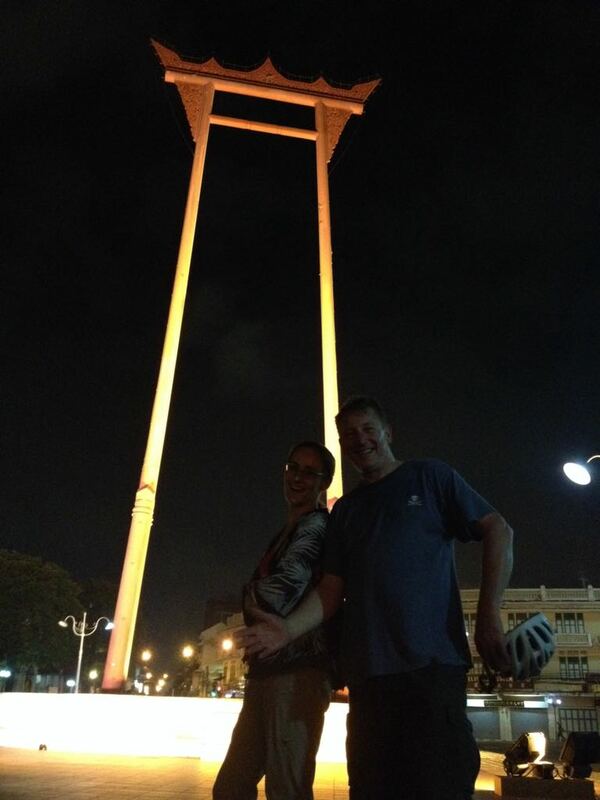 His excitement was contagious, and in no time we found ourselves wandering the streets of Bangkok. The infamous Khao San road was close by, though by the time we arrived there the night life had fizzled out to a few street food vendors and many tipsy tourists. One vendor hawking laughing gas sold us big bottles of Chang, which we enjoyed as we wandered. 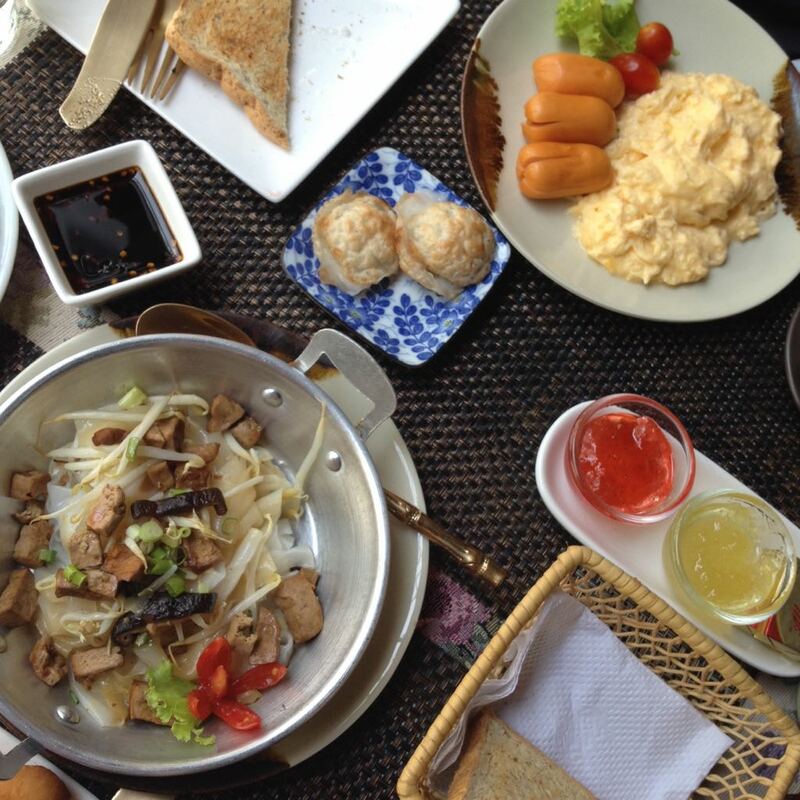 Our toast: Welcome to Thailand! Our cozy room at the Old Capital Bike Inn. • Lovely brunch at Old Capital Bike Inn. Everything about this place is great: the hospitality, the location, the brunch, the decor, the amenities in the room, the proprietor’s evening bike tour. If you are looking for a boutique hotel in Bangkok (around $100 USD per night) then there is nowhere better. • Canal ride to the Jim Thompson House. Jason, our host at the Inn, suggested we take a canal boat to the Jim Thompson House. What a fabulous recommendation! The ride cost 9 baht one-way for one person, which equals about 25 cents. The boat ride was as enjoyable as the destination. • The Jim Thompson House. I have been there before, but it was well-worth a second visit. Dad and I enjoyed the house tour. Jim Thompson was an American ex-military man who fell in love with Thailand in the mid-twentieth century. He had an eye for design and invested in the potential of Thai silk. He made quite a fortune and built a beautiful estate full of antiques in the heart of Bangkok. Now his home is a museum with a nice shop full of his designs and a rotating art space. Well worth the visit! • Wandered around one of the many shopping districts. Dad enjoyed a beer sold out of an old Airstream trailer in the MBK garden and marketplace. Dad in every mood, taking in the Bangkok traffic. • Lunch at Mango Vegetarian Restaurant. Healthy. Fresh. Delicious. 100% vegetarian. • Traditional Thai massage. Nothing feels better after a trans-Pacific flight than a nice massage. Even better is that it costs less than $10 USD for an hour. • Drinks at Brown Sugar, a bar that has enjoyed much acclaim over the years. We were there before the crowds so I imagine it would be a little more exciting to be there later at night when the live music gets going. • Night ride around old Bangkok with Jason. The Old Capital Bike Inn doesn’t have the word “bike” in its name for nothing! Jason, the owner/manager of the Inn, is an avid biker and he enjoys showing the city to guests in the evening. 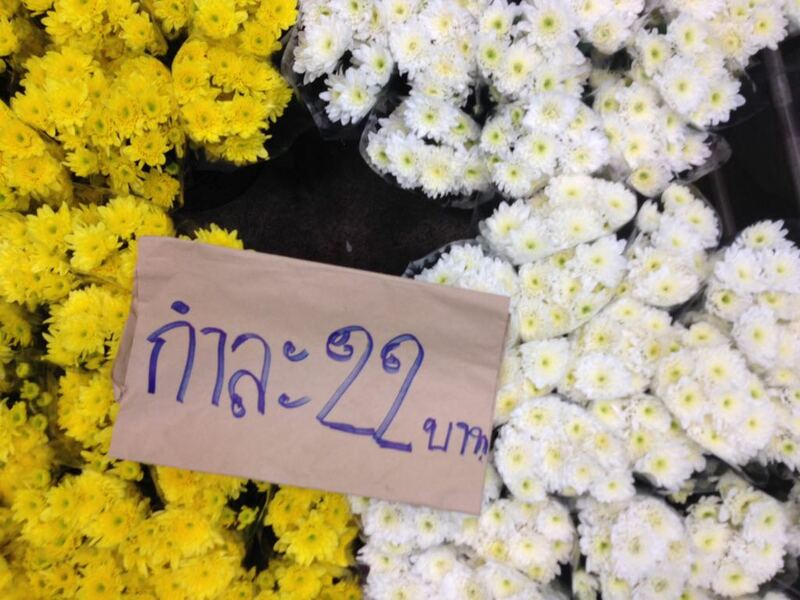 Highlights of the tour included the Grand Palace, a community takraw game, and the flower market. It was a great day full of friendly people, great food, and plenty of new sights for both dad and I! Our brunch at the Old Capital Bike Inn was amazing. It is always a good day when there is vegetarian food to be had. 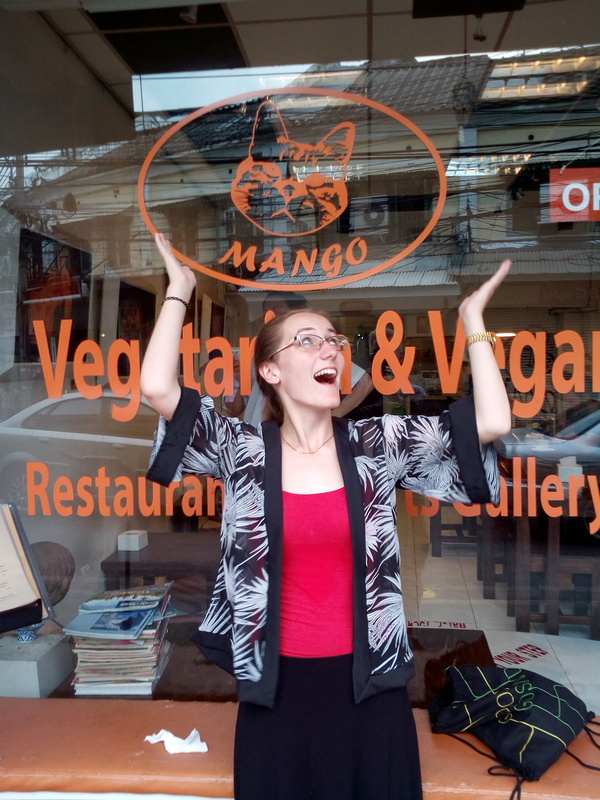 Mango was a great little veg-onlly restaurant near our hotel. 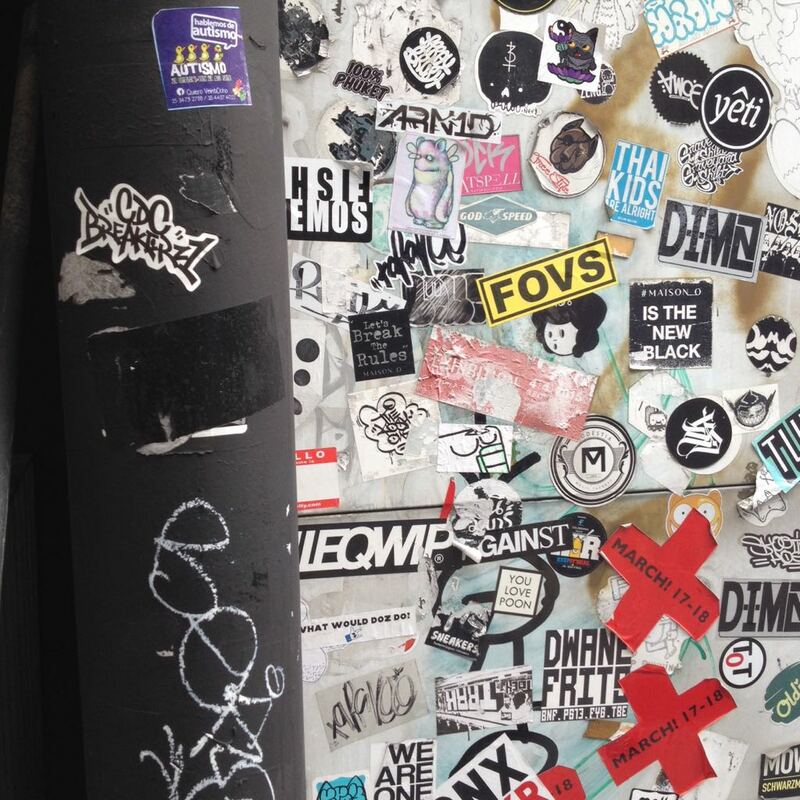 Stickers and grafiti by the MBK mall. 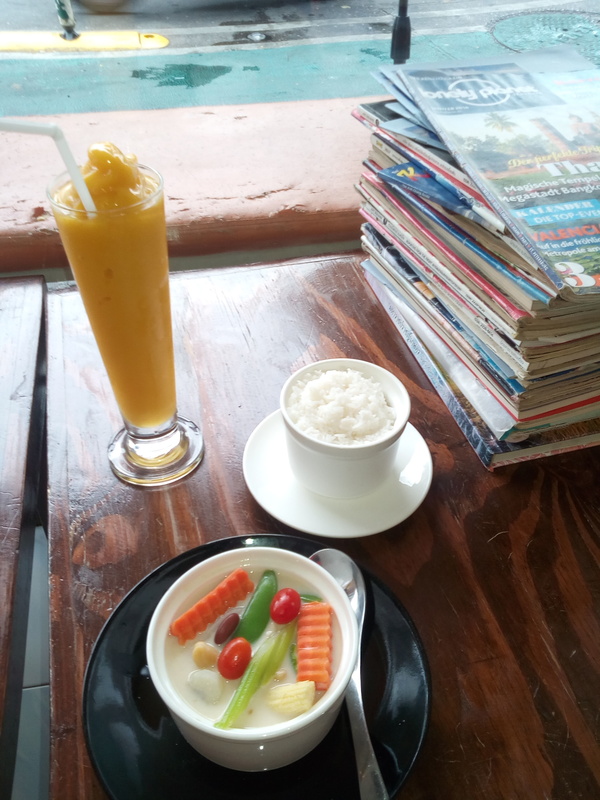 A fresh and healthy lunch at Mango. 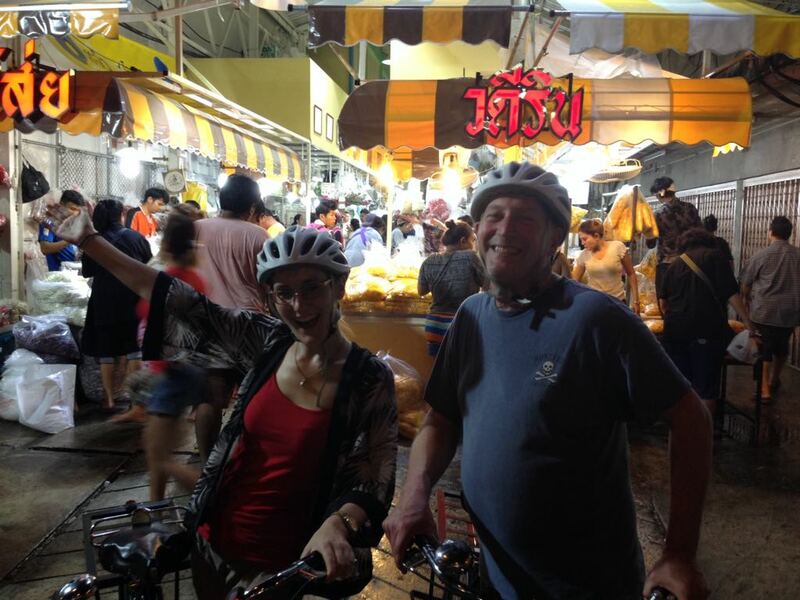 Dad and I riding our bikes through the evening flower market in old Bangkok. Flowers for sale in the evening flower market. 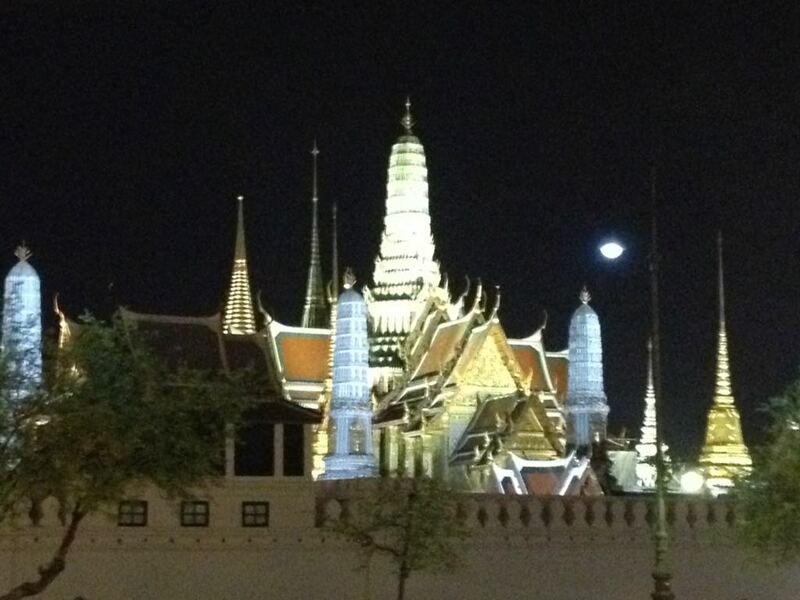 One of Thailand’s many fabulous temples lights up well at night. 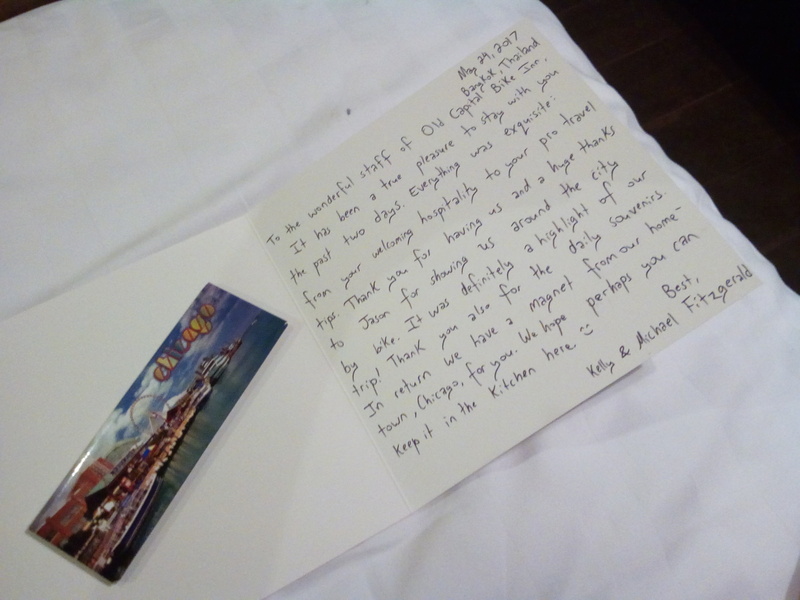 We enjoyed our hotel so much that we left them a note and a little gift from Chicago. You can’t really see us but we’re there: Dad and I in front of the Giant Swing. • Airport pick-up with Clayton, a.k.a. CJ, one of dad’s friends from high school. Clayton has been in and out of Thailand since the ’90s and currently lives in Phuket with his Thai wife P’Nong and their son, Tyler. Clayton picked us up and took us to breakfast on the beach. From the bustling city of Bangkok to the quiet waves of Naiyang Beach… not a bad change! We picked up Clayton’s wife, P’Nong, and went back to the house. • Lunch at a floating restaurant. 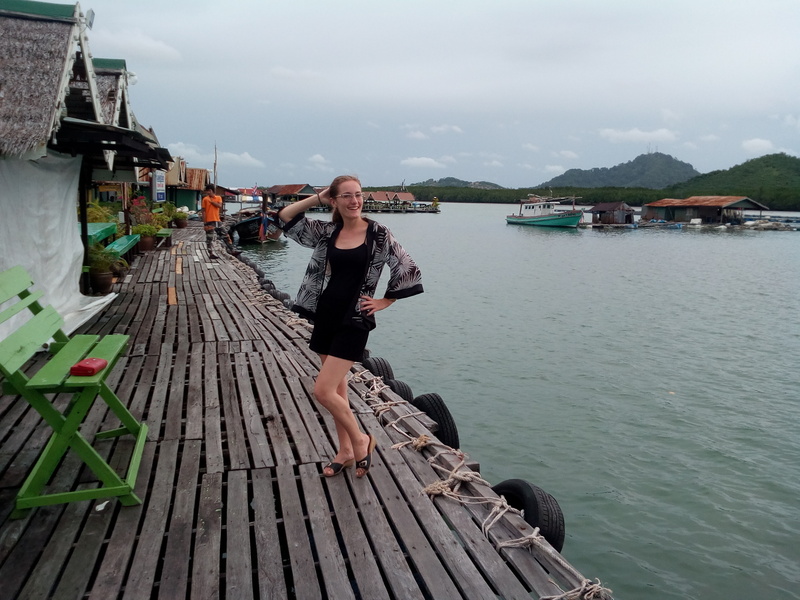 After settling into Clayton and P’Nong’s lovely and spacious home, we went out to lunch at a floating restaurant accessible only by long-tail boat. The restaurant (unsurprisingly) specializes in seafood. The menu is three-dimensional. You can walk out into the fish pens and select your meal right from the water–shark, crab, any kind of fish–you want it, they’ve got it! • Long afternoon. Dad and Clayton caught up by the pool while P’Nong and I went to pick up Tyler from the international school down the road. He is in third grade and already has a busy schedule. The school grounds were lovely and very welcoming. It seems like a great place to spend one’s childhood. • Sunset and dinner on the beach. We left the house just in time to catch the sunset at Naiyang Beach. It was a quiet beach with only a handful of other tourists picking up shells along the shore. A family from Myanmar, evident by the man’s longyi*, arrived at the same time we did with an adorable baby in tow. For dinner we went to The Boss, right across the street from the beach, which had live music and a great atmosphere. Dad is all smiles before meetig is long-lost friend, Clayton. 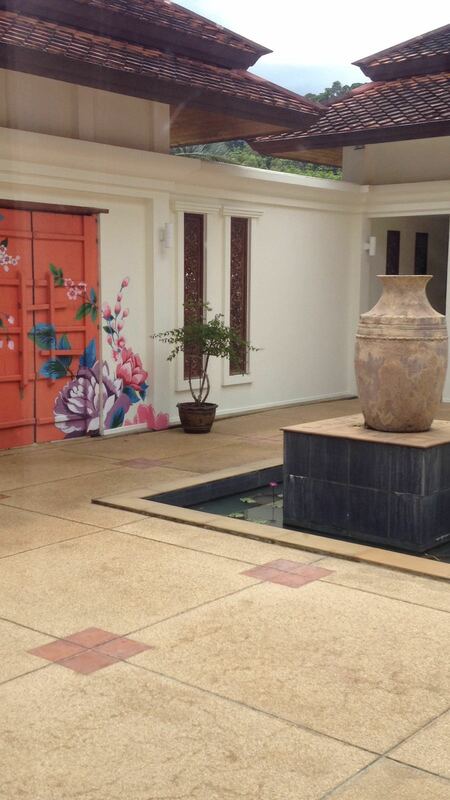 A snippet of Clayton and P’Nong’s lovely home. Me, P’Nong, and Dad at the floating restaurant after lunch. 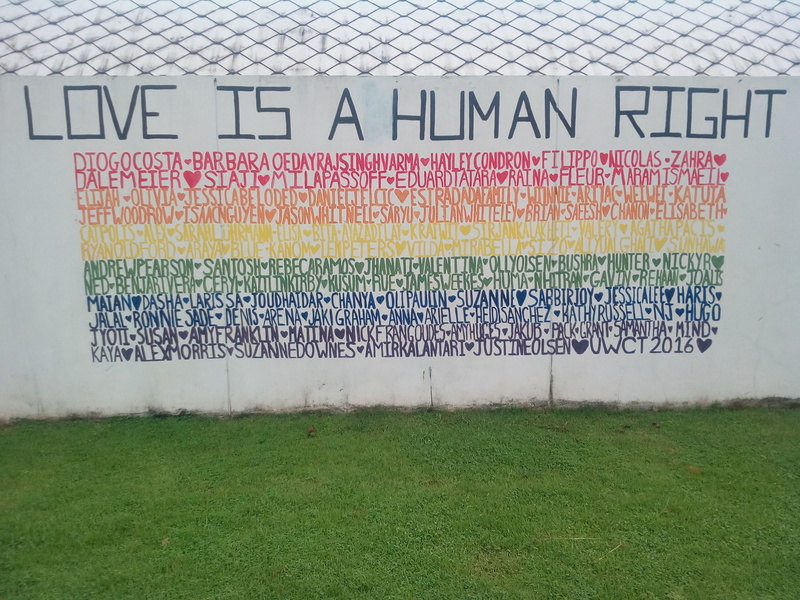 Wall art at Tyler’s international school. 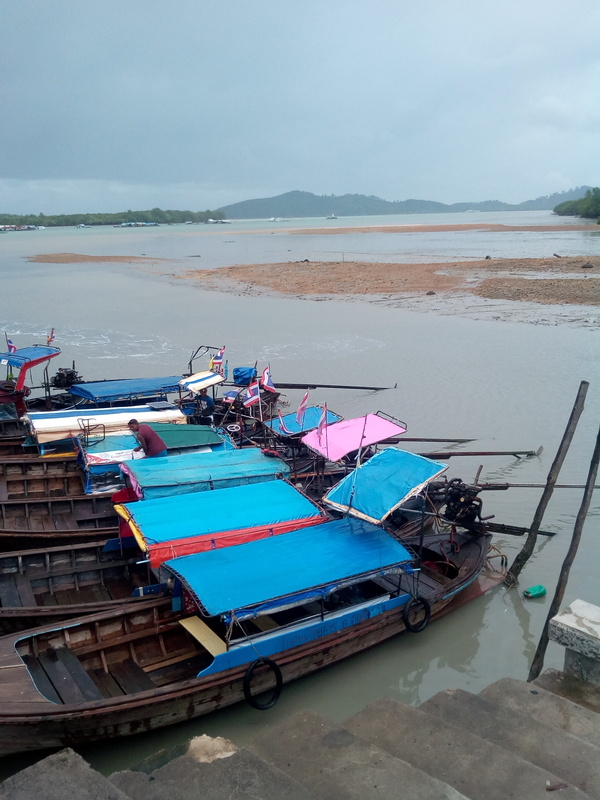 Boats waiting to take diners across the water to the floating restaurant. 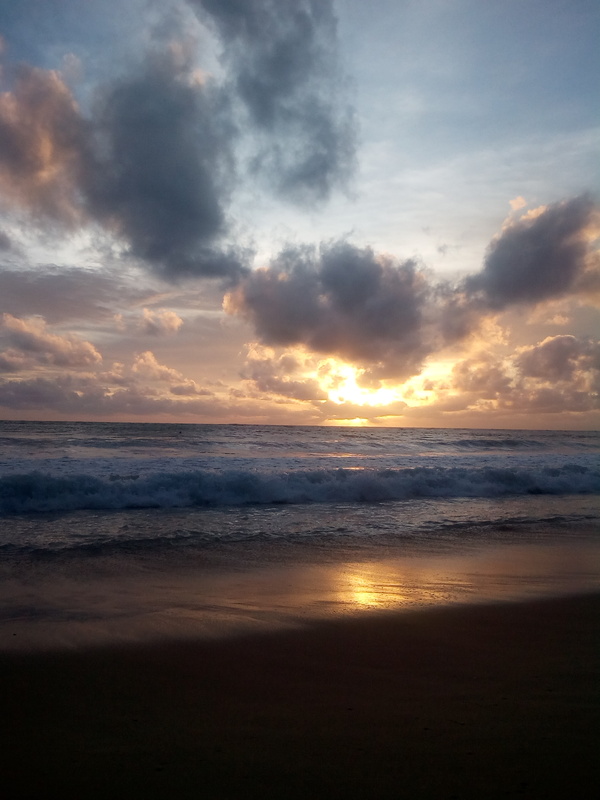 A lovely sunset at Naiyang Beach, Phuket. Farewell dinner! Thanks for everything Clayton, P’Nong, and Tyler. See you next time! • Jungle hike. P’Nong suggested we go out for a bit, so I put my tablet away and pulled on some hiking pants. She loaned me some shoes (I only brought sandals) and we hopped on Clayton’s scooter to go for a ride. At first we went to a zip line place, though I wasn’t interested in zip lining so we went down the street to a nature preserve instead. 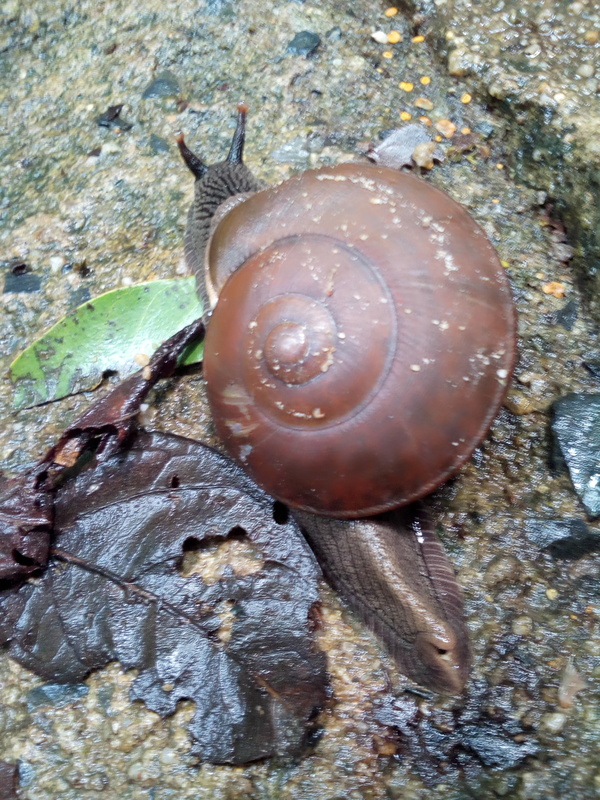 Saw lots of critters: lizards, butterflies, birds, snails, dogs, and all manner of insects. Apparently there are cobras and other snakes around here, though thankfully none of them made an appearance. • Lazy afternoon. Clayton and P’Nong’s house has a lovely pool and we all made good use of it during our stay, especially on Thursday afternoon. • Dinner at the Black Cat. Our farewell dinner was at the Black Cat, a nice outdoor restaurant with plenty of Thai and Western options. It was a smorgasbord, even for me because P’Nong took charge of ordering plenty of veg and non-veg options. A lovely end to a lovely stay. 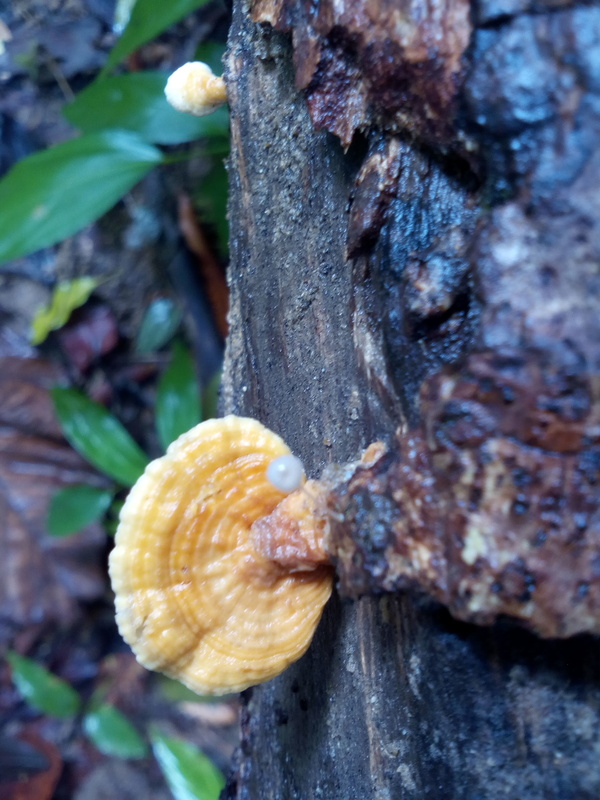 Tropical mushrooms: not for eating. 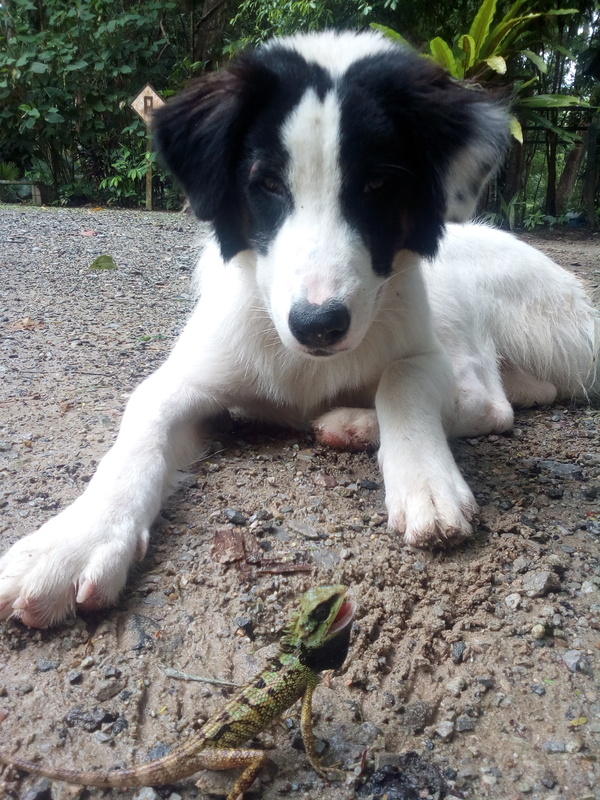 This dog and lizard seemed to be friends. * Longyi is a dark-colored, checkered fabric that is worn like a sarong by men across Myanmar. Pants are becoming more common there, but the traditional longyi still has strong appeal across generations. Hi Kelly, looks and sounds like your Dad and You are having a ball. How is Clayton? I always liked him. How funny he has a kid. I remember him only as a kid. We’re looking forward to seeing you soon. We have a heavy travel schedule this summer but, we must see you! Love the update and pictures! I’m so happy that you two are on this wonderful adventure. Can’t wait to see you Kelly!